Until the introduction of Replicate, the answer involved a complicated setup of rsync, firewall configuration, and installation of two devices in different physical locations. Replicate changes all that, as now the entire configuration is cloud-based on Replicate servers. Let’s take a look and see how it works. Replicate requires two ReadyNASes and licensing for each at $221 a shot. While it is possible to use Replicate to mirror two Ultras, it’s not where NETGEAR is positioning the product, since the Ultra line does not come with data “snapshots” enabled. For our tests, NETGEAR provided a ReadyNAS Business Pro as the source (snapshot enabled), and a ReadyNAS Ultra 4 for the "remote" endpoint. Data snapshots are common in business backup, with a snapshot-enabled device temporarily storing the current file’s state while running a backup. This allows backup to occur while allowing the file to be accessed by users and programs. Cloud storage vendors use this feature to provide revision information. Replicate uses snapshots to maintain data integrity during long file transfers. I set up the two ReadyNASes on the same local network to start. It is possible to bring a remote unit online and begin mirroring data to it. But it’s not recommended due to the assumed large size of the first transfer. Once the two units are online, a user will go through the usual add-on installation process. This involves downloading a BIN file, and “updating” the NAS firmware using this BIN. (Check out my Orb Live review for the full process). Once both units have the software installed, you then configure each device with its license key. You also have to create a ReadyNAS Remote account, since Replicate uses the same technology as Remote to access mirror your files. Once the initial setup is complete, management of the replication jobs then runs on Replicate’s web servers using encrypted back-channel communication. Replicate’s web interface is simplistic (see the Gallery for screenshots), which I tend to prefer over flashy interfaces that complicate the task at hand. Backup job creation is simple. There are two options available: System backup or Data backup. Data backup allows a user to select some or all of the data on their NAS device. System backup backs up the data and OS of the source device. Both can be scheduled to a very granular level, which allows for jobs to run when internet connections are not utilized for business activities. Replicate gets installed on individual devices and initially configured on them. 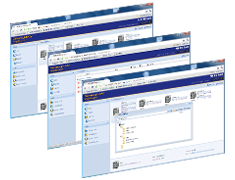 Once initial configuration is complete, all backup and restore management happens on the Replicate website. Replication jobs show up in the job monitor for scheduling, and can be run manually from here. The website does a good job of providing feedback about a running job. The data restore interface could use some more explanation, but functions reliably. This is taken from ReadyNAS Remote's documentation, but provides a good idea of how the devices communicate. So how does Replicate actually work? Well, there’s a bit of networking magic involved. The devices make an initial SSL encrypted connection out to the Replicate servers. From there, the Replicate servers initiate a private key exchange between the two devices using 3DES encryption. The devices then start what is basically a VPN tunnel between them, and the Replicate servers then usually step out of the data transfer path. In my testing though, the Replicate servers usually had to stay in as mediators for the data transfer. This is similar to my experience with Pogoplug’s remote access features. I can only assume it’s because my router is configured in a way that won’t allow the VPN traffic to start up. An issue I ran into during testing was while Replicate’s web interface could see both units and schedule jobs, the backups would fail almost immediately. The error message described a communication failure, which I thought was rather odd as the devices were on the same network. After some sleuthing, I tried enabling ReadyNAS Remote on both devices, but left it in its default, non-configured state. This immediately resolved the problem. We have reached out to NETGEAR for an explanation of why this might happen, and will update the review when we have an answer.This is a problem with the version of Remote that ships with the ReadyNAS Pro's current firmware. There is an updated version of Remote available on the ReadyNAS site, and the fix will be included in the next general firmware release. Performance was pretty mediocre. A backup between the two devices on the same LAN occurred at a speed of about 7 MB/s. This is compared to the normal speed between the two devices of about 60 MB/s across my Gigabit Ethernet network. While I could try to blame my router for this, 7 MB/s roughly equates to 56 Mb/s, which is about twice as fast as my internet connection. My data set was a single 9 GB file, which I used in order to get the best possible transfer speed over the local LAN. Switching to 5 GB of assorted file sizes did not change the performance, and so it would seem this speed is an inherent limit in the Replicate software. Restore is also fairly simple, although NETGEAR could do with having a more prominent place for the restore documentation. Restoring a device requires picking the device you want to restore TO, not the device you are restoring FROM. You can then select which backup job is pertinent to your restore, and then select from a date when the job was run. Speed was about the same as the backup jobs I ran for each set. I did take the Ultra 4 offsite to a friend’s house to simulate how well the system worked when moving devices to, for example, a branch office. The devices found each other quickly and operated the same way as a local LAN setup. Backup speed was limited by our connection to each other though, so it’s important to schedule the backup jobs to run when Internet connections are not used. Replicate does not have the ability to throttle job speeds, which might be a useful feature, since I could see replication lasting in the morning hours for a particularly large backup. Access is completely through the Replicate portal of the site, as mentioned earlier in the review. The site is fairly straight forward to use, and provides good real-time updates for the current backup job that's running. Security is pretty good, although I would argue that 3DES is a little outdated as the government has officially replaced 3DES with the more advanced AES encryption scheme at this point. 3DES requires lower processor overhead, however, and so is easier to implement on integrated devices. I would like to see the ability to configure Replicate to use either one, as business users are more likely to be security-minded about their data. Support goes through NETGEAR's normal support channels. One of the issues I continue to have with ReadyNAS support is that documentation is split between readynas.com and netgear.com. This usually requires resorting to Google to find which site has the information you are looking for. A more unified support channel would be better suited to the business users that Replicate hopes to attract. Overall, Replicate functioned as promised. It’s an expensive proposition, however, but becomes more cost effective as the data set grows. I will be taking a look at a cloud-based solution by Egnyte which also integrates with ReadyNASes. Egnyte provides a lower cost of entry to backing up data on a ReadyNAS, but quickly becomes expensive the more data you want to back up. This is where Replicate comes in, and provides a reliable solution for large data set backup.